In the style department, Malia Obama has definitely been coming into her own lately. The 18-year-old is a pro at choosing age-appropriate yet stylish pieces, including a printed midi skirt and floral skater dress from ASOS and a pretty Reformation summer frock. Thanks to her latest look, we now know that ASOS is not the only brand she's loyal to—Everlane is also high on her list. Back in June, Malia was spotted in a cool backpack from the San Francisco–based brand, and now she's worn another sleek Everlane piece: The Cotton Poplin Square Shirt Dress ($88). With its under-$100 price tag, perfect-for-summer poplin fabric, and sophisticated shirtdress silhouette, it's basically the perfect dress in our minds. And, of course, it has an Obama's approval—do you really need any more convincing? You better click "add to cart" before this sells out. Scroll down to see Malia Obama's full look and shop her Everlane dress! 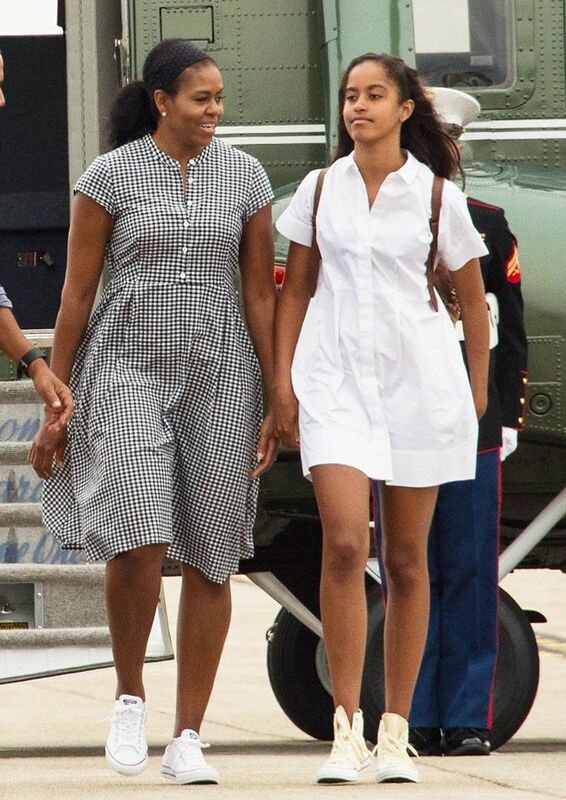 On Malia Obama: Everlane The Cotton Poplin Square Shirt Dress ($88). What do you think of Malia Obama's dress? Tell us in the comments below, and then shop more Everlane dresses online!